Guitar studies from a young age have lead Grant Sambells to multiple scholarships and to first-class Honours and Masters degrees. He has received tuition from Don Andrews (Central Coast Conservatoire), Clair Wenborn and Dr. Peter Calvo who was taught by Len Williams, the father and teacher of the famous guitarist John Williams. Grant has given numerous performances at prestigious venues such as the Sydney Opera House, Government House and the Art Gallery of NSW (Picasso exhibition & at the opening of the Rupert Bunny exhibition). 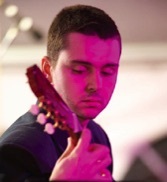 He played the premiere of Lachlan Moods by NZ born composer, Ross Carey - whose works have been performed by guitar legend Kazuhito Yamashita and the Australian String Quartet - at the Forbes Music Festival, 2011.